Wrought ironwork, meaning hand-shaped iron, was popular among the wealthiest Americans during colonial times. They paid steep prices to equip their brick and stone townhouses with beautiful iron fences. By the 19th century, blacksmithing became a domestic profession and more homeowners were able to embellish their homes with ornamental iron fences. In today’s modern economy, wrought iron fences are still available, but many homeowners prefer to use steel or weatherproof aluminum to create more durable versions of colonial wrought iron. 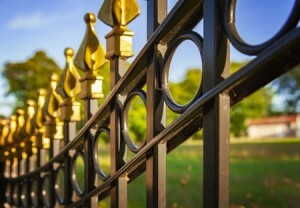 As you consider the type of metal that you might want to use to create your own fence, take into consideration the level of detail you hope to achieve, how much maintenance you want (or don’t want), and your ideal budget. There is definitely a metal out there that can match your vision. With tubular steel, sheets of steel are bent into hollow pickets, posts, and rails. Panels are welded together and screwed into posts to create a strong and attractive fence. In fact, this form of steel is strong enough to accommodate 8-foot-long panels, which equates to fewer fence posts around your property. Since steel can scratch and rust, you need to be prepared for more maintenance with this selection. This type of metal nearly matches the appearance of steel, but is four times lighter and never rusts. Aluminum has become a very popular fence material, thanks to its impressive durability and low maintenance. If you want an elegant metal fence that doesn’t require much maintenance, this is the choice for you. For all of the professional help you need selecting your material and designing your perfect fence, reach out to West Florida Fence in Tampa, Florida. As a full-service fence and gate company that offers more than 150 years of combined experience, West Florida Fence can provide all the fencing services you need. Call (813) 251-5883 to request a quote and learn more.